So we did it and it was awful and that’s all I’ll say about it. We felt like we needed to stay busy today and get out of the house. But where do you go when you need to cheer up, to forget you had a dog yesterday and today you don’t? Why, Canada of course! The people in Canada are so nice and polite and they always seem so damn happy. 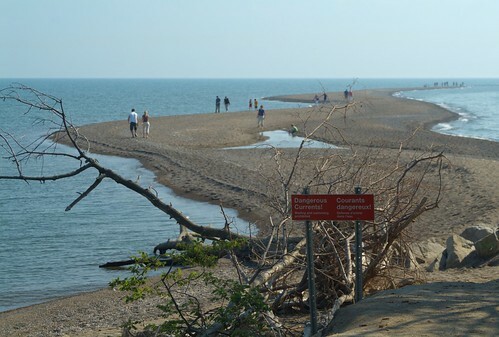 So we packed up our cameras and a lunch and took off for Point Pelee National Park in Ontario. The plan was to take pictures of the park’s famous butterfly, bird, and dragonfly populations, to get lost in the beauty of nature and try to not think about Nikki. What we didn’t know was that every bird in Canada has already migrated south (they didn’t hear there was a warm front coming) and they apparently took the butterflies and dragonflies with them leaving behind a park full of happy Canadians and their furry four-legged friends. Yes, it turns out that our friendly neighbors to the north do love their dogs, and not only are they allowed at the park, but at this time of the year dogs are the main attraction as they are the only living things for miles around beside the humans (and the blood thirsty Canadian mosquitoes which are tinted an odd shade of maple leaf red). Still, it was good to get out of the house…but sad when we got home and there was no yappy little dog to greet us at the door. The point at Point Pelee, that’s it waaaaaaay out in the distance…where the sand comes to, what else? a point. Me, looking at the point, or maybe I’m looking at a seagull. See it, that tiny spot that looks like a speck of dust in the sky? Wait, maybe that is dust. I’m thinking I need to rethink those pants I’m wearing, that is not a bum George Clooney would covet, is it? Mister bookbabie scanning the trees for signs of life. 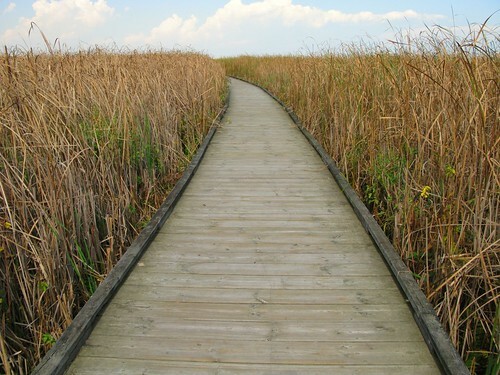 The marsh walk at the park. Quite lovely if you like to look at miles of tall grass-like plants. This entry was posted in my life, photos, travel and tagged my life, pets, photos by Lilli Day aka bookbabie. Bookmark the permalink.